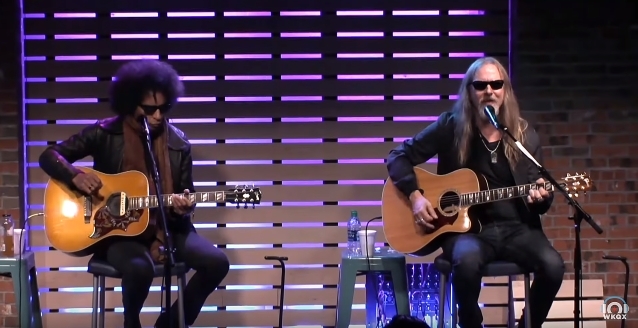 Video footage of ALICE IN CHAINS members Jerry Cantrell (guitar, vocals) and William DuVall (vocals, guitar) performing a short acoustic set at The Lounge, Chicago’s premier music venue that hosts private, intimate concerts and exclusive events for 101 WKQX, can be seen below. ALICE IN CHAINS is touring in support of its latest album, “Rainier Fog”, which arrived last month. The disc marks a few firsts for ALICE IN CHAINS: in addition to being their first album in five years, it’s their first album for BMG and their first time recording in their hometown of Seattle in more than 20 years (worth noting that the album title is a tribute to Seattle). The “Rainier Fog” recording process also saw the band spend time at Henson Recording Studios in Los Angeles and at the Nashville studio of producer Nick Raskulinecz. “Rainier Fog” is the third straight ALICE IN CHAINS album recorded with Raskulinecz and engineer Paul Figueroa. The album was mixed by Joe Barresi (QUEENS OF THE STONE AGE, TOOL). 2013’s “The Devil Put Dinosaurs Here” was ALICE IN CHAINS‘ second disc with DuVall, who joined in 2006 following the death of Layne Staley.